Los Angeles City Councilmember and Chiair of Trade, Travel and Tourism Committee Joe Buscaino, Air Italy Chief Operating Officer and Los Angeles World Airports Chief Operating Officer Samson Mengistu with Air Italy Chief Operating Officer Rossen Dimitrov and cabin crew members celebrating the launch of the new LAX to MXP route. “When you have a destination as exquisite and enticing as Italy, you cannot have enough routes to get there," said Los Angeles City Councilmember Joe Buscaino, Chair of the Council’s Trade, Travel and Tourism Committee. "This is why I am so pleased that Air Italy is beginning its newest route between L.A. and Milan. This new venture is a part of a growing pattern of international investment into Los Angeles' tourism economy as L.A.'s message, that everyone is welcome, resonates with visitors across the globe." 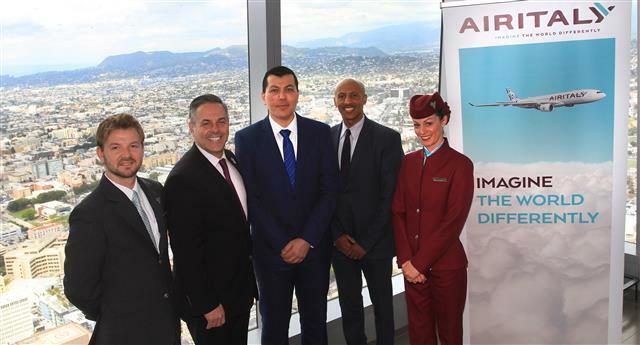 "With the launch of our new and exciting gateway in Los Angeles, California, our network will be expanding significantly, providing even more fantastic options for our equally rapidly expanding customer base,” said Rossen Dimitrov, Chief Operating Officer, Air Italy. “With the launch of our new on-demand dining experience, coupled with Los Angeles as a new destination, our overall product, service and network will be significantly enhanced, expanding our customers’ choices and quality." LAX is the third largest U.S. market for passenger demand to/from Milan. Last year, about 97,300 annual passengers traveled between LAX and MXP via connecting flights. The Los Angeles inaugural flights were the first to showcase a new on-demand dining experience for passengers. This new option allows Air Italy passengers to travel with convenience, comfort and the ability to choose when they'd like to dine and order à la carte. Air Italy passengers can also enjoy signature Italian cuisine, accompanied by a selection of champagnes and Italian fine wines. 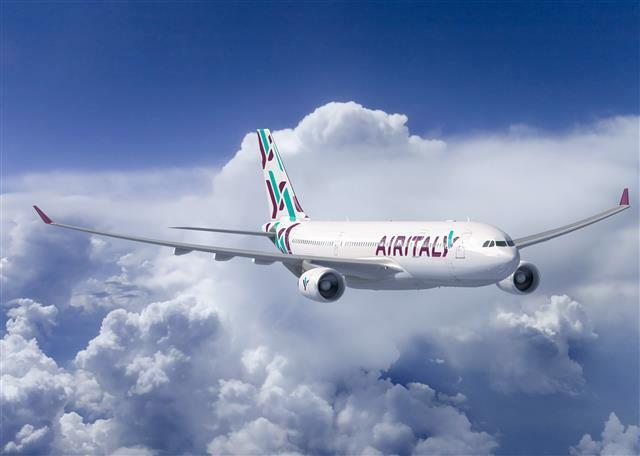 Air Italy will fly this nonstop route using a new, long-haul Airbus A330-200, which offers up to 24 seats in the exclusive Business Class cabin, making it possible to fly with maximum comfort in fully lie-flat seats. The Economy Class cabin, with 228 seats, also provides Air Italy’s guests with highly personalized service. All passengers will have access to Wi-Fi service and an extensive in-flight entertainment service. The flight times are expected to be 12 hours to Milan Malpensa Airport, and 13 hours and 50 minutes on the return flight to LAX. Depart LAX at 6:50 p.m., arrive MXP at 3:55 p.m. Depart MXP at 1 p.m., arrive at LAX at 4:50 p.m. This new route is also also intended to maximize connections to major cities in Italy including, Rome, Naples, Palermo, Catania, Fiumicino, Lamezia Terme and Olbia. For more information or to book a flight, please visit www.airitaly.com. For more information about LAX, please visit www.flyLAX.com or follow on Twitter rel="noopener noreferrer" @flyLAXAirport, on Facebook at rel="noopener noreferrer" www.facebook.com/LAInternationalAirport, and on YouTube at rel="noopener noreferrer" www.YouTube.com/laxairport1.